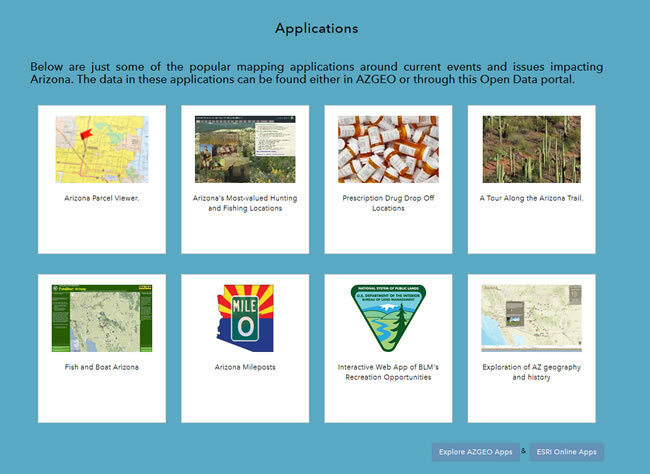 The Arizona State Cartographer's Office recently launched AZGEO—Open Data on behalf of the Arizona Geographic Information Council (AGIC), creating a one-stop shop for data from the State of Arizona, participating municipalities, and other authoritative sources. The site was created using Esri-hosted ArcGIS Open Data, included as part of an ArcGIS Online subscription. ArcGIS Open Data gives organizations the ability to set up websites that the public can use to search for and download data quickly and at no cost. AZGEO—Open Data offers a wide range of data on a variety of topics including zoning, air quality, employment, and transit. The site also contains useful applications including the Arizona Game and Fish Department's Arizona's Most-Valued Hunting and Fishing Locations, the Arizona Trail Association's A Tour Along the Arizona Trail, and Rx Drug Drop-Off Locations from the Arizona Department of Health Services. The Arizona State Cartographer's Office hosts and designs AGIC websites and manages the AZGEO data and servers, said Arizona state cartographer Curtis Pulford. 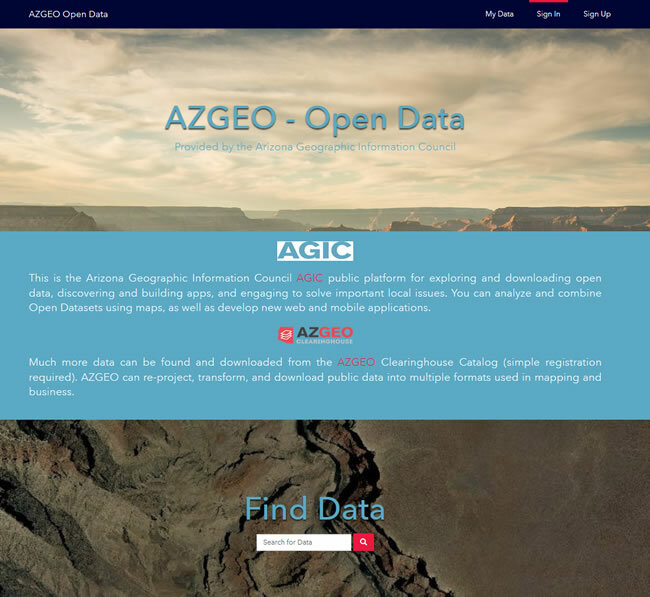 He said that the new AZGEO—Open Data portal aligns with AGIC's vision to provide credible, timely, and accurate geographic information that Arizona decision-makers and citizens can use. The site is a good resource for app developers trying to create solutions that address important issues in the state. Creating an open data site using Esri technology was simple, according to Pulford. "The ease of setup was rather amazing," Pulford said. "After we spent a little time studying ArcGIS Open Data and brainstorming on how we could best use it, we had most of our Open Data site operational in one afternoon. The one aspect that [best] matched our needs and made it work for us as part of our state portal [AZGEO] was the ability to filter content for delivery. It was very important that we show only those custodians we recognize as [being] authoritative and Arizona-centric. That is what we have always done through AZGEO." AZGEO—Open Data is a collaborative effort that gives government organizations—including cities such as Phoenix and Tucson—the ability to federate open data in one common site via individual ArcGIS Open Data sites that each organization has set up. Pulford said that AZGEO—Open Data collects what is deemed authoritative data from these ArcGIS Open Data groups. That gives authoritative data custodians with ArcGIS Open Data sites the ability to channel information through AZGEO—Open Data in a dynamic way, using web services rather than static data. "Right now, we're only harvesting from discoverable Open Data sites," Pulford said. For example, the public transportation agency Valley Metro provides information on its ridership numbers via its own ArcGIS Open Data site, Valley Metro GeoCenter, as well as AZGEO—Open Data. 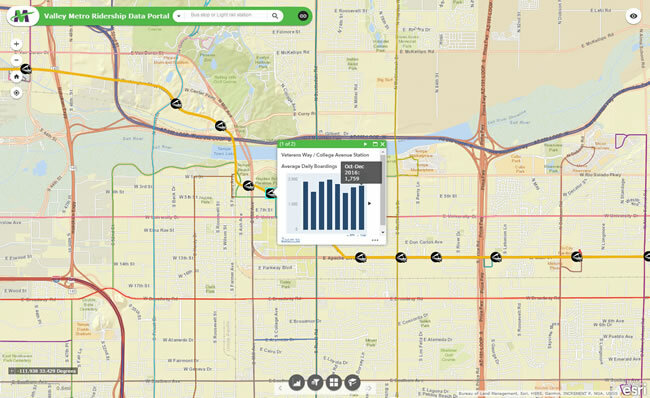 People will find applications like the Valley Metro Ridership Data Portal, which features ridership data along with information on Valley Metro bus routes, light rail stations, light rail and bus ridership, transit centers, and park and ride facilities. "Valley Metro provides public transit service to 16 different jurisdictions in the Phoenix area. Open Data provides the most efficient means of [giving] each of these jurisdictions—as well as the public—accurate and authoritative transit-related GIS data." said Cory Whittaker, GIS administrator for Valley Metro. The City of Glendale provides information on planning and zoning through its open data portal Glendale Arizona Open Data and the AZGEO—Open Data site. Phoenix does the same. This means that entrepreneurs and others interested in pursuing economic development projects can go to one place to find data from multiple agencies, including information on planning and zoning from municipalities and public transportation from Valley Metro. Pulford said that, over time, improvements will be made to AZGEO—Open Data that will strengthen search and categorization capabilities, make more open data available, and provide additional showcase applications. "We have now added literally hundreds of new data sources," Pulford said. "I think the data consumers within our state will be excited to discover these, and I can't wait to see the new and exciting ways they make use of them."